Fletcher Priest Architects has won planning permission for a scheme to revive one of London’s most idiosyncratic and popular locations – the urban quarter that is home to the Piccadilly Lights and the historic Rainbow Corner. The 24-hour city block borders Piccadilly Circus, Shaftesbury Avenue’s Theatreland and Soho’s Denman Street and attracts 100m people a year. Fletcher Priest’s proposal lightly envelops the site with a folding geometric skin of ceramic tiles, and creates a roof-top landscape of creative workspaces that open onto terraces with breath-taking views across central London. The Piccadilly Circus island site has been a planning conundrum for more than 60 years and a series of design proposals have failed to gain planning consent. The empty space behind the Piccadilly Lights has not been used since the 1950s. 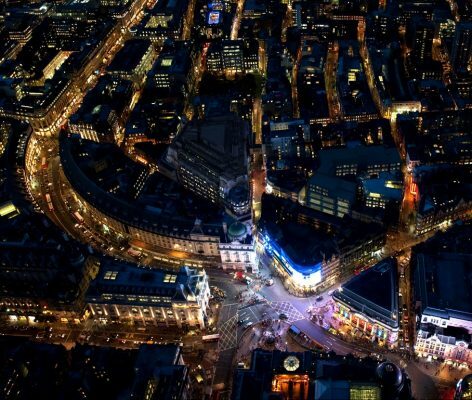 In 2012 Europe’s largest property company, Land Securities, asked Fletcher Priest to come up with a design that could turn the apparently unusable space behind the Lights into desirable offices, shops and residential while keeping the lights and existing shops fully operational throughout. At the same time as opening up new space, Fletcher Priest proposes to enhance the character of original buildings on the site and improve the public realm. The scheme, which has won plaudits from Westminster Council, solves the jigsaw puzzle of uses and apparently contradictory interests, with a playful, rational approach that belies the complexity of the site. The proposal creates a winter garden behind the Piccadilly Lights, bringing in natural light from above and making the space useable once more. The distinctive folding roof-scape will be made from point mesh covered with thousands of mass-crafted, glazed ceramic mouldings.